Gold is regarded as an auspicious metal in India and world over. It's yellow lustre, elegance and opulence, has made it the most loved precious metal at any given period of time. It has been used in jewellery from ancient times, obviously because of its brilliance and salient appearance. In its original shape, gold is dense, soft, shiny, malleable and ductile to enhance its solidity and strength. Some metals though can add to gold's hue and radiance. Various metals mixed with gold defines its purity and karat and its different tones from black, rose and purple to gray, yellow and white. However, the prices of some platinum group metals can be comparatively on higher side, gold is always considered the most popular precious metal and its value is a standard for many currencies globally. Gold is regarded as an epitome of purity, value, royalness and everything that combines these attributes. In all eras, Gold means riches and dignity. What is Gold Karat ? A karat is the purity count of gold which is written as k or kt in abbreviated form. For example 18 karat gold means 18/24 of the object is gold. However, it's different from a diamond carat. It's in the range from 10kt to 18 kt, 22kt, 24 kt being approximately 99% pure gold. The purity of gold can also be measured as fineness which expresses the purity of gold in 1,000 parts. For example, 990 gold fineness, shows 99% purity of gold. Most popular colors of gold are yellow gold and white gold. Gold's natural colour is warm yellowish color, however it can have a variety of different colors depending on the alloy mix and it's polish. Gold's natural colour is yellow. It is the most popular and universal gold color world over having 18kt,22kt and 24kt being the most usual purity units of gold. While 18 karat gold is warm and beaming with 75% purity, 22kt has the commanding 91.6% purity. 24 kt gold has the maximum of 99.95% purity. White gold is gaining more and more popularity these days. It's an alloy of gold which is achieved by using a white metal like nickel or manganese or palladium. It's purity is also measured in karats. However, the properties of white gold change depending on the metals mixed and proportions applied. To maintain shine of your gold wedding rings or engagement rings and keep them looking new, do not forget to keep aside gold jewellery ornaments while being involved in any activity where there is a chance of a scratch, chip or damage. 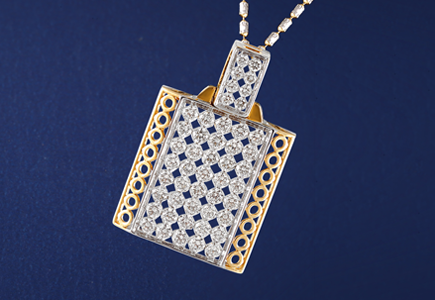 Your gold jewellery should always be stored in its original containers, cloth-lined jewellery boxes or soft pouches. For cleaning, simply soak the jewllery in a lukewarm solution of soapy water. You can scrub with a soft-bristled brush such as a toothbrush, if needed. After that to dry out the gold jewellery, use a clean, soft, dry cloth. Use of paper towel or rough, thready rags should be strictly avoided. In nature, every diamond is different depending on its value and beauty. Its proximity to perfection is judged by the GIA's (Gemological Institute of America) fundamental criteria known as the 4Cs: Carat, Color, Clarity & Cut. We have added the 5th C for Certification as accurate assessment of a diamond is only possible before being set. The carat is the unit of weight and subsequently also of the size of a diamond. It has been named after the carob seed, which was originally used as a unit of weight for diamonds. One carat is around 0.2 grams. That doesn't mean a bigger diamond however should always be the best one. For reaching a top level of perfection, the factors of color, clarity and cut all are must considerations. Shilpa Lifestyle's diamond rings have the range from 0.50 CT to 1.50 CT. Although larger stones are also available upon customer request. A perfect diamond has be of light color. Although diamonds bear slight shades of color tending to yellow and brown. The whiter the diamond, the rarer it is. The GIA parameters of color scale classification begins from D (Colorless) and covers upto Z (Light Yellow). For its diamond jewellery Shilpa Lifestyle only selects diamonds belonging to the 'colorless' range of : D, E, F. Fluorescence is non—existent. Diamonds have to go under incredible heat and pressure which sometimes cause internal or external inconsistencies in them. For the clarity of a diamond the factors of quantity, position, color and prominence of these inclusions have a significant impact. If the flaws are fewer, that means the diamond is rarer and more precious comparatively. There are 11 grades of diamond clarity as per the GIA standards. Shilpa Lifestyle only uses diamonds of the select grades of FL (Flawless), IF (Internally Flawless), VVS1 and VVS2 (Very Very Slightly Included). The shape and proportions of a polished diamond are defined by its cuts. Conventionally, the round— brilliant is considered to be the most classic shape. Square, marquise, oval, pear, heart and emerald are the other popular shapes. A good cut creates a balance between the diamond and the light, simultaneously affects it's brightness (the inside and outside reflection of the white light), flares of color (fire) and scintillation (the pattern of light and dark areas). The GIA rates the cuts from 'Excellent' to 'Poor'. For making engagement diamond rings Shilpa Lifestyle prefers the brilliant and emerald cuts. Shilpa's diamond jewellery is made from the diamonds duly certified by the independent institutions like IGI and DGLA that are recognized internationally. These certificates are the ID of the diamond and impart adequate information regarding all the characteristics of the diamond. The light performance is the story of the diamond's beauty, ascertained by the way the light is reflected out of the diamond and returned to the observer. A diamond's light performance can vary with its natural characteristics, its Clarity inclusions, its Color and by its Cut. The Cut is the work of the craftsmen, the diamond polishers which has significant influence on the diamond's light performance. If it's too shallow the light leaks out from the bottom of the diamond, cannot be seen thereby. If it's cut too deep, then the light seems lost completely. While an optimally cut diamond makes sure that the light is reflected out through the top of the diamond, and its full beauty shines through. Subject to the size, type and location of the inclusions of a diamond its Clarity determines the amount of light returned back out of it. The Color, usually if in the lower grades, affects the hue of light reflected back. Thus, the diamonds have these four light performance parameters, which describe the different effects that each light characteristic brings out in the diamonds. How will you choose a Perfect Diamond ? When you decide to gift jewellery made with diamonds, a diamond becomes as precious and as valuable for you as your loved ones. Therefore choosing a perfect diamond is very vital and many criterias are to be considered as well. The diamonds have many qualities, colors, shapes and sizes. Once you have chosen the type of jewellery and the size of the diamonds is selected, it's important to set your budget and pick the right diamonds suitable with your personality and lifestyle. Conventionally, the diamonds are chosen keeping in mind the 4C's: Carat, Clarity, Color and Cut. The 4C's determine the various characteristics of the diamonds, that are more concerned with their rarity rather than the beauty which impacts their real value. Today, thanks to the advanced technology, we can accurately evaluate the beauty of the diamond by measuring its individual light performance. It is measured by the way the light reflects out of the top (table) of the diamond, back to the beholder's eye, and by the dance of the sparkle and colored flashes it produces, as well. Knowledge of your diamond's light performance, helps you to purchase the diamonds as beautiful as possible and within your budget. Platinum is considered to be one of the most precious metals. Being the perfect choice for today's woman it is ravishing, outstanding and exquisite, still it has got inherent solidity and ductility. Go for the precious platinum and perfectly express your personality, power and flair. Platinum is ageless, with everlasting radiance and strength. Platinum's unparalleled durability and resistance to wear and tear makes it the most impeccable and safest metal, which means your jewellery will be protected forever of abrasion. Its shape does not change or get weary hence precious gems are held steadfastly and unshakenably. The compactness of platinum makes it a long-lasting than any other metals used in jewellery. Platinum is pure, has the natural white colour and is skin-friendly too. Platinum jewellery is 95% pure (in comparison 18 karat gold is 75% pure), platinum never gets faded or discoloured, on the contrary remains naturally white forever. Since platinum is such a pure metal, naturally it is unlikely to cause an allergic reaction and perfect for those having a delicate skin. Platinum is a rare metal, a treasure loved by the rich and famous since millenniums. Found in very few places worldwide, platinum is considered to be 30 times rarer than gold. Platinum jewellery is distinctive and regarded an expression of personal identity. With a white radiance that never decreases, platinum raises the scintillation of a diamond. Platinum#&39;s better endurance allows your precious stones the safest placing. The platinum jewellery of Shilpa Lifestyle maintains standard Quality Assurance with surety of the characteristic purity of platinum. How Platinum is different from white gold? Platinum is a metal, naturally white that doesn't lose its magnificent splendour. Whereas white gold is an alloy made using the yellow gold. Although white gold seems alike platinum, normally requires new plating from time to time to sustain its whiteness, which adds an extra cost. 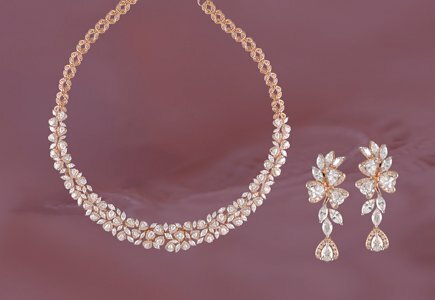 How to ensure that the jewellery is made of platinum? All platinum jewellery presented by Shilpa Lifestyle is hallmarked assuring of its 95% purity. Look below to find the mark on your platinum jewellery. What is the reason behind platinum being more expensive than gold? Because of its rarity Platinum's price is bound to be higher than that of gold. Moreover, making a piece of platinum jewellery also needs a higher level of craft and skills. How to take care of platinum jewellery? You can clean platinum jewellery the same way as you clean any other fine jewellery to keep its original appearance and make sure that it stays. You may use a mild solution of soap with lukewarm water and softly wipe it with a cottony cloth, or purchase a jewellery cleansing solution. Can a platinum jewellery scratch? Yes, it can. Because all precious metals would scratch and platinum can't be considered an exception. Although it's special in the way that it is only displaced, not completely gone. So keep polishing your platinum jewellery from time to time if you wish to maintain its high radiance.